A witty journalist finds himself ripped away from a city life in Moscow into a quest that leads him to the realm of Fayroll, a virtual reality video game. Given orders to write a series of fluff pieces about the game and its developers, he accidentally starts an unusual journey which can change the entire virtual world, and maybe even the real one. “At times, he feels he was meant to be an innkeeper someplace on the outskirts of Bree in J. R. R. Tolkien’s Middle-earth. 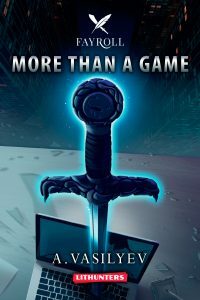 However, in real life, Andrey Vasilyev is a much-celebrated Moscow-based author, as well as one of the originators of the relatively new, yet insanely popular, LitRPG genre that blends cyberpunk, classic sci-fi, and fantasy. By his own admission, Andrey started writing in his late 30’s and only “because there was nothing handy to read,” but after his first two books gained nearly instant acclaim, he had to give serious thought to changing his current banking career to that of a professional writer. Fortunately for his readers, who had voted his debut novel More Than a Game the “Best Book of the Year 2014,” he never looked back after that. Over the next few years, he continued work on his now-bestselling Fayroll series, maintained a blog, and participated in various multiple-author projects. Andrey is also the author of The Raven’s Flock and The Arch series, which will soon be available in English.